These Morse Taper Expanding Mandrels are held directly in the lathe or mill spindle or in a rotary table with an MT2 bore. 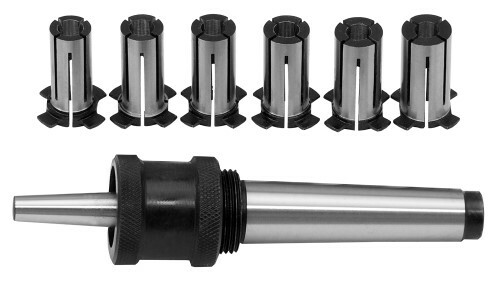 Each sleeve has a range of 0.5mm and is mounted in the eccentric ring machined in the front of the knurled quick release nut which screws onto the taper of the main body. (Like an ER collet only in reverse). we cannot accept any responsibility for inaccuracies. Errors & Omissions Excepted. Copyright © 2013 - 2019 Ausee Pty. Ltd. All rights reserved.